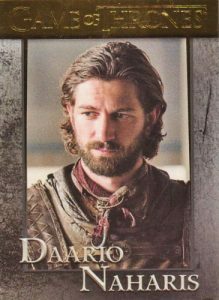 Ushering in the chaos of many converging forces, 2016 Rittenhouse Game of Thrones Season 5 takes aim at the fifth season of the blockbuster series with a format that should be very familiar to those that have collected previous releases. 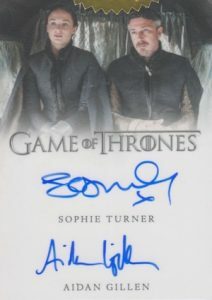 Each box includes two on-card autographs featuring actors from the acclaimed show. The base set keeps its tradition with 100 total cards specifically geared to the season. 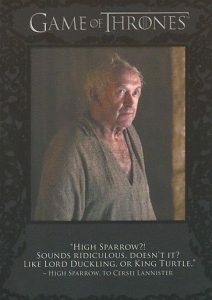 This includes cards that highlight each episode from Season 5 and there is a also a detailed look at the specific subjects with 60+ character biographies. Building on that total are Foil parallels (1:3 packs) and Gold parallels (1 per box). 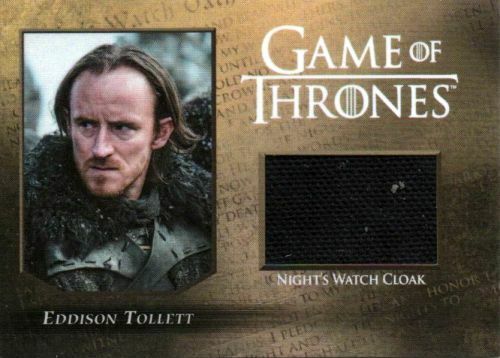 Headlining the release, just like in all the other Game of Thrones sets, are the many show Autographs. 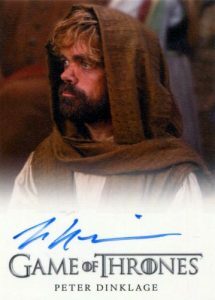 Although most of the bigger names have already provided autographs at some point in the run, most have only signed for a few releases and there are always the new characters to incorporate. 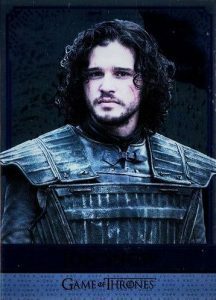 Top options in 2016 Rittenhouse Game of Thrones Season 5 include main characters Kit Harington (Jon Snow), Lena Headey (Cersei Lannister), Maisie Williams (Arya Stark), Peter Dinklage (Tyrion Lannister) and Sophie Turner (Sansa Stark). Basic inserts include previously-seen options like the art-based Beautiful Death (20 cards - 1:24 packs), Quotable (9 cards - 1:12 packs), and Relationships (9 cards - 1:24 packs), while Reflections mirror cards (16 cards - 1:96 packs) offer a new look at the series. 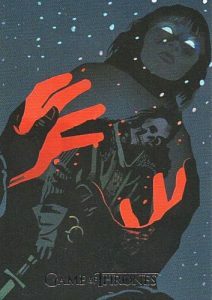 There is also a limited Gold parallel for Beautiful Death that averages 1:144 packs. 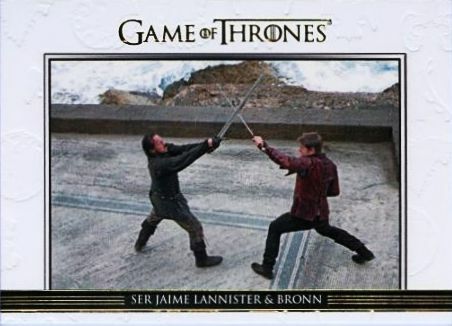 Limited and quite valuable, Sketch cards feature artwork directly drawn on the cards. 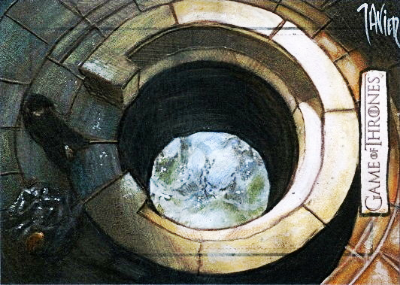 Relics are also available in small quantities. Both are randomly inserted. 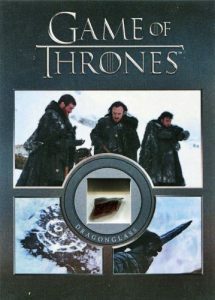 Found in each case, Case Toppers feature die-cut shield cards for either House Baratheon or House Bolton. PARALLEL CARDS: Foil (1:3 packs), Gold (1:24 packs), Printing Plates 1/1 (Archive Box). SP Print Runs: L = Limited 300-500 copies, VL = Very Limited 200-300 copies, EL = Extremely Limited 100-200 copies. PARALLEL CARDS: Parallel - 1:144 packs. PARALLEL CARDS: Gold - 1:144 packs. lot of strong names ! good autograph season. 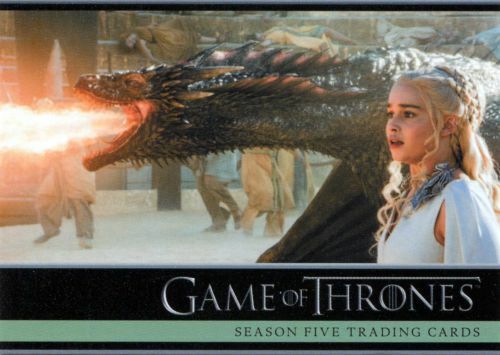 Game of Thrones Season 5 Factory Sealed Trading Card Box! 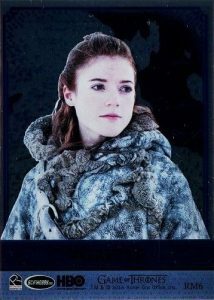 + P1 Promo Card!